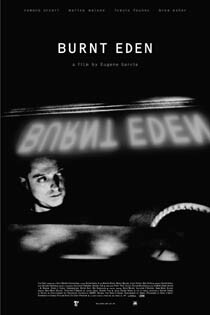 Burnt Eden is the story of Ivan, a young man in his late twenties caught in a familiar, often deadly loop - he is intelligent enough to see what is wrong with his life, yet can't find reason enough to avoid the crash he's so clearly headed for. Burnt Eden evolves as a series of intense events that occur in Ivan's life over the course of a single week, during which his raging abuse of alcohol and drugs finally pushes him to a resolute break from a blurry past. Whether that break is metaphorical or real is left unclear. It is a struggle with demons of the most familiar order - unfulfilling relationships, lack of money, and disorientation in the larger picture that is the world. On the journey towards his own private exit point, Ivan leads us through an electrifying vision of the urban hell he navigates.